Precursor m/z is a measure of the mass/charge for the precursor ions seen in MS1. 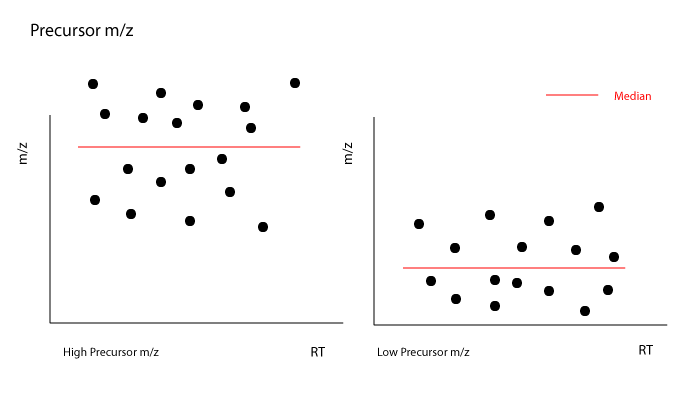 High or low m/z may be associated with inefficient ionization. The Precursor m/z metric is the median value of m/z for all identified spectra. Consistent median m/z values indicate instrument stability. The Precursor m/z metric reports the m/z where the mass spectrometer is tuned to best detect peptides. Changes in this "sweet spot" are reflected by changes in the Precursor m/z metric. A high value of Precursor m/z could also be caused by inefficient digestion so that there are multiple missed cleavages. Missed cleavages will result in longer peptides and thus larger Precursor m/z. Higher values can correlate with inefficient ionization, while lower values can correlate with short, non-specific peptide identifications. The Precursor m/z depends on the charge state of the spectra that were matched to peptides. In contrast the Percent +1H, Percent +3H, and Percent +4H metrics report on all the detected ions whether they match to a peptide or not. If these related metrics are out of bounds, but Precursor m/z isn't, then it may mean that there are an unusually large number of non-peptide ions in the sample. If Precursor m/z is unusually small, it may be because of non-specific digestion resulted in short peptides. These short peptides might be detected in a larger than normal Percent Semi-Tryptic. Precursor m/z also goes up if more sample is loaded. This might be because there is a higher concentration of peptides available to be chosen with a fewer charges per peptide. If this is the reason for higher Precursor m/z, then the Total Ion Current should also be higher. In general, the more potential peptides your sample contains the more accurate this metric is.